Have you ever wished for a second kitchen to store items you use for entertaining along with extra appliances and a sink for preparing food? If you’re planning a basement remodel, you may find the extra space you need. When designing a lower level living space, think of a basement kitchen, kitchenette or bar area the same way you would if you were remodeling the primary kitchen of a home. The elements include appliances, cabinet storage, a sink, counters, lighting, electrical outlets and flooring. Here are some design ideas for creating an attractive and functional second kitchen in your home. 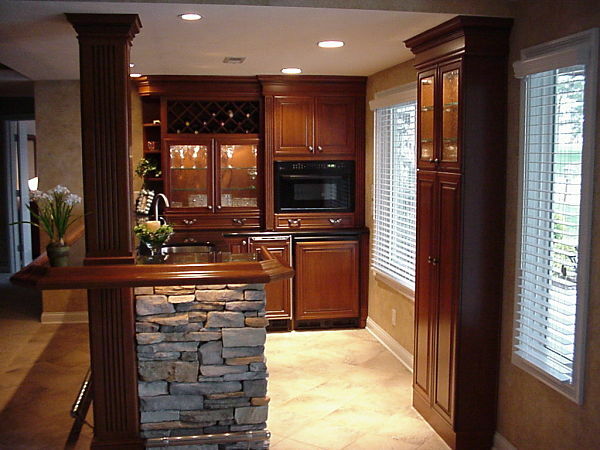 Most basement kitchens include a bar area for informal dining and preparing and serving food. 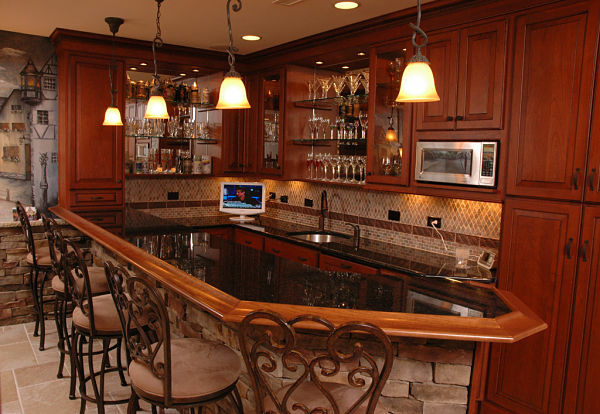 Under-cabinet appliances are ideal for bars. If you decide to use full size kitchen appliances, look for Energy Star certified refrigerators and dishwashers. Keep in mind that heating and cooling systems, lighting and water heaters are also Energy Star certified as you plan your remodeling project. Door swings of refrigerators, ovens and dishwashers and the extension of pullout drawer-style appliances are important to consider in the design of a kitchen to create an adequate workspace. Refrigerators and coolers. Today you will find refrigerator drawers, beverage coolers, wine coolers and ice makers that fit compactly under the counter of a bar. Ovens. Microwave ovens are available in many sizes and can be installed under a counter, on a counter or can be built into a wall. If you need extra capacity for baking, a convection/microwave oven may be the perfect solution. A full size range with an oven will need ventilation, consider the advantages of a microwave oven/vent hood. Dishwashers. A dishwasher is a handy appliance to have in a bar area. If you don’t need a full size dishwasher, consider a space saving drawer dishwasher that pulls out for easy loading of glassware and plates. Flat screen televisions. Flat screen TVs have found a place in the kitchen. 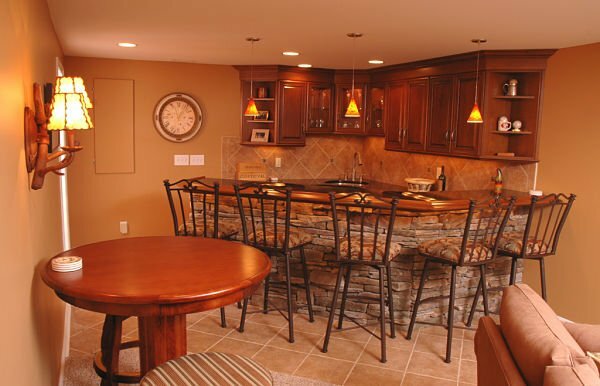 Discuss cable installation with your contractor if you plan to add a flat screen to your basement kitchen. When planning cabinet storage, make a list of the items you want to store in the kitchen. Will you be storing dishes, platters and bowls that you use primarily for holidays or entertaining? If so, how deep should the cabinets be for storage? Do you plan to cook in the basement kitchen? Will you need to keep pots, pans and bakeware on hand? Are these items better stored in drawers? If you plan to store glasses, would you want to display them in cabinets with glass front doors for easy access and aesthetics? How many drawers would you need for small items such as flatware, cutlery or utensils? Where will you put waste? Will you need food storage? Where will you store items for clean up? Orientation is important when determining where to place a sink. Think about how you work in a kitchen. Would you want the sink to be located on a back wall with a prep counter or would you prefer to have the sink on a bar to be able to face people and engage them in conversation while you are working? A single bowl stainless steel bar sink is ideal for rinsing glasses and discarding ice. 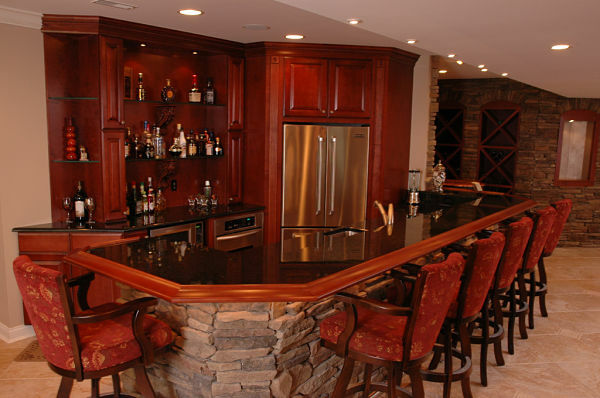 Stone counters are popular for basement bars. 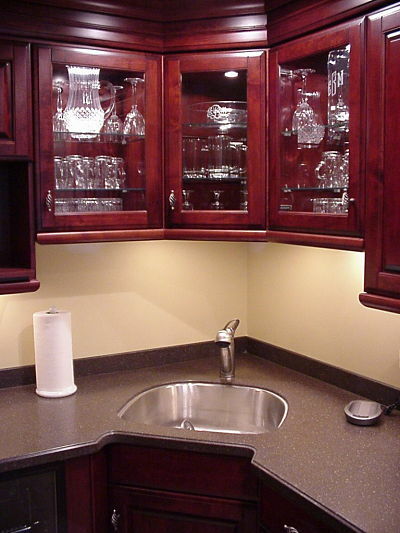 Quartz and granite are easy to maintain and add sparkle. New high definition laminate counters are also a good option. They provide the look of stone and are more affordable. There are edge options for laminates including wood edging that can give a bar a distinctive look. When choosing a counter, also think about backsplash options especially if you plan to include a sink or an area for food prep. Select lighting for general illumination, task areas and aesthetics as you would for a primary kitchen. A rule for placement of recessed lights is to install 4-inch lights four feet apart and 6-inch lights six feet apart. 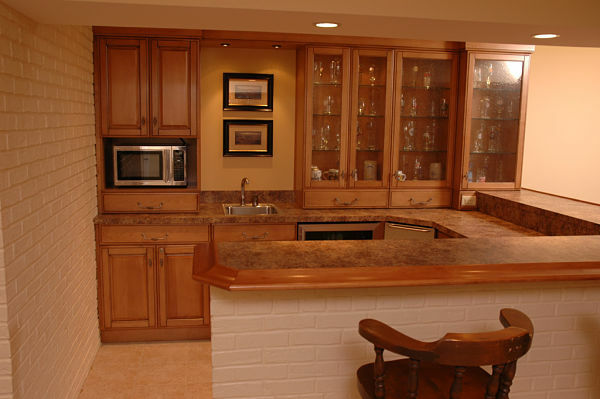 A kitchen design professional can help you determine the best options for lighting the space. Include the placement of switches in the design and determine if you want the option of dimmers on some lights. Outlets are sometimes overlooked but are an important item in kitchen design. There should be an adequate number of outlets for small appliances. Be sure to discuss outlet placement with your contractor. 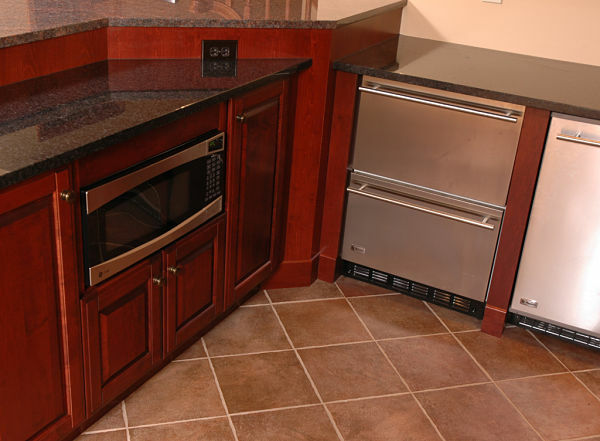 Flooring for a lower level kitchen that is used for serving beverages should be waterproof, slip-resistant and easy to maintain. Ceramic tile and laminate floors are good choices. 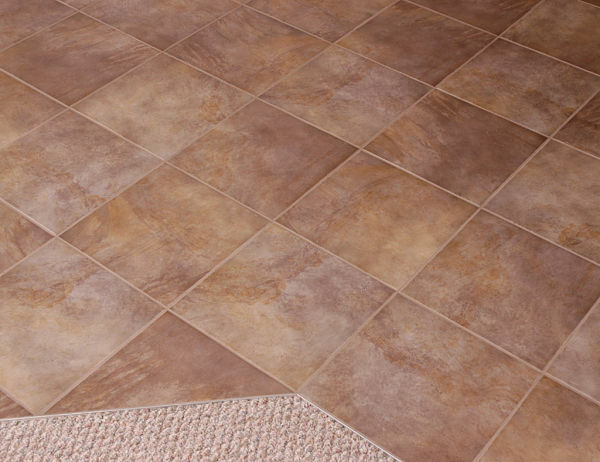 Affordable vinyl sheet flooring is made to look like stone and ceramic tile and is also a great choice for basements.